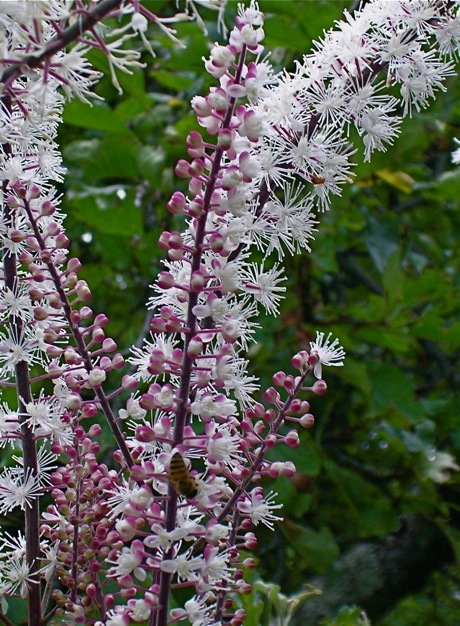 When I planted it, years ago, it was Cimicifuga racemosa ‘Atropurpurea.’ Now, without my having to do anything, it’s Actaea racemosa (or possibly A. simplex) var. atropurpurea. Or maybe not. The nomenclatural tangle growing around these plants defies all but a botanist’s understanding and I’m not sure about them, either. What matters from the gardener’s point of view is that they’re gorgeous, almost trouble free, and as I seem to have mentioned before, fantastically fragrant. Some authorities describe A. racemosa, a native of moist North American woodlands, as the species that smells disagreeable. 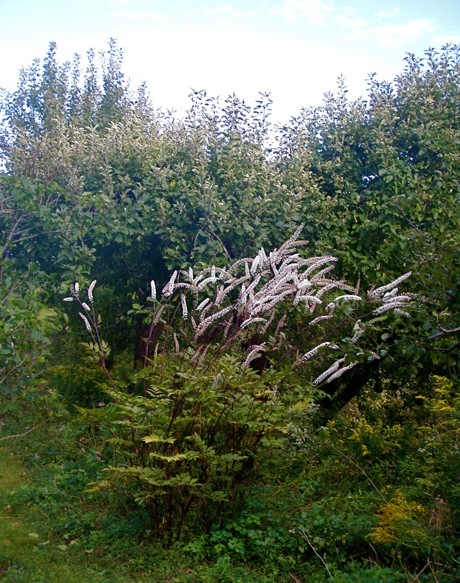 If so, that would be a big help; telling one common Actaea from another is – let’s just say challenging. In addition to the fragrance, snakeroots offer a kind of architectural twofer: first a bush, then a fountain. From spring to midsummer the plants are reasonably compact, with many stems of large compound leaves that are lovely enough in themselves to warrant a place in the garden. Typical snakeroot leaf, this one less purple than it would be if the plant got more light and more moisture. Snakeroot is slow to get going, but it grows from spreading rhizomes and once it takes hold a healthy plant can easily be a squarish mound 4 or 5 feet in diameter. Then in midsummer, transformation! Suddenly there are flowering stems that pull the height up to 6 or 8 feet, and they’re as close as don’t matter to naked from the point of emergence to the big plumes of bottlebrush flowers. A dark backgound shows them off best, but even with light behind them they seem to float unmoored, far above the foliage. Did I mention they’re fragrant? 1) The ideal spot is fertile, moist, well drained and in partial shade, but the spiffy black leaved cultivars like ‘Hillside Black Beauty’ and ‘Chocoholic’ need a fair amount of bright light – think full northeast exposure – to keep their intense color. 2) In my experience, these plants are tough. Even though they’re moisture loving, they can survive considerable drought – looking awful, admittedly – and come back strong as ever when conditions improve. But not until they’re established. For the first year or two, it’s essential to provide water if nature does not. 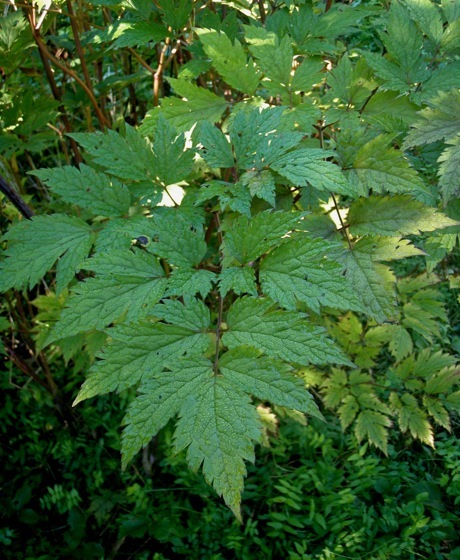 3) Bugs don’t like bugbane and it seldom gets diseased. Rust is the most common problem and can be severe if the plant is already stressed by drought. It would be convenient if Actaeas did well in wetlands, but standing moisture leads to root rot. 4) In undisturbed open woodland, snakeroot self-sows and can form large colonies. YAY! …or sort of yay; you do have to be patient. Seeds need a warm/cold/warm cycle to sprout and seldom germinate until the second spring after falling. New plants are tiny and can remain nearly invisible for a couple of years, which is why the undisturbed part is important. After the plants are visible, expect to wait another couple of years before they start blooming. 5.) Transplanting small plants is easy, dividing big ones is not; violent root disturbance tends to set them back. Fortunately, they seldom need dividing. Like peonies they can stay in place for a couple of decades without developing dead centers. * Powerful perfume is a two edged sword; snakeroot is a plein air plant. Bring it in as a bouquet and the smell is indeed strong enough to act as bug repellant. Black cohosh is a beautiful plant! I especially like the ones w/ blackish foliage. Also love your description of the garden’s sound(s). 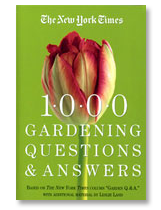 I love the way you drew us into your garden in the opening paragraph–and what a gorgeous plant! I didn’t know this plant until it started to bloom in our backyard a week or so ago. The patio/garden people must have planted it 3 years ago when the created the stone patio in our wooded back yard. What a wonderful surprise. The only problem is that I have to be careful sticking my nose in there for a sniff. The bumble bees are loving it, too. And thanks for pointing out the bees – our snakeroot is always musical with them and I’ve been bumped a couple of times but so far I’ve never been stung. I see on your very appealing blog that you’re a fellow mushroom collector and appreciator of Tom Volk. Do hope you’ll check out the mycology/mycophagy posts. There are a lot of them but they’re very easy to find – there’s a listing for mushrooms in the dropdown menu under In The Wild (on the navigation bar at the top). How does it look in the winter? I live in zone 5. thank you! Cimicifuga dies to the ground each fall. In theory, you could leave the dead bloom stalks for winter interest, but they aren’t very strong and – at least in my gardens – the plants look quite ratty by the end of the season. I remove anything that looks diseased, but otherwise just let them collapse. Handsome new growth begins quite early in spring. Hope this helps. I know thius plant is good in our constantly changing winter and summer conditions here in S. Central Alaska. I thought mine was a weed because I planted it years ago and hadn’t seen it for a long time, but as soon as conditions were right, I saw it, thought “What a sweet little weed” and let it grow, then found the old scrap of the marker that identified it, looked it up, and here I am!